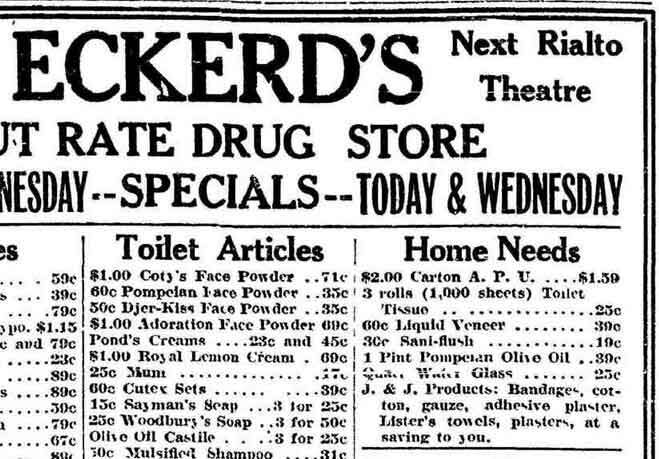 Early American pads in newspaper ads. Early Modess pads in newspaper ads. Until about the 1880s women in America and Europe probably either made their own menstrual pads (see Norwegian pads), bought washable pads (here) or wore, um, nothing (read about this). But then Hartmann in Germany and Johnson & Johnson in the U.S. made throw-away pads, similar to what women use today in many countries. Ende des 19. Jahrh. (...) Die Verbandstoffirma Paul Hartmann stellt für die Europäerinnen die ersten Wegwerfbinden her - die 'Mulpa-Damenbinde.'" [End of the 19th century . . . . The bandage firm Paul Hartmann made the first disposable pad for European women - the 'Mulpa Ladies Pad.'] She didn't give a reference for this. J&J's contribution was Lister's Towels, apparently a product of the "tiny Lister Company, whose principal reputation was as a notorious price cutter. Johnson bought it out for $2,000," writes A Company That Cares, the company history of Johnson & Johnson, p. 52. The company probably took its name from the British proponent of germ theory and cleanliness, who worked to reduce the morbidity and death rate among patients by killing germs using a spray of carbolic acid. Johnson and Johnson manufactured "Lister's Towels" in 1896, the first commercial disposable pad, made of gauze-covered cotton. But because turn-of-the-century morality prevented advertising these "unmentionables," the pads did not reach many women and were eventually withdrawn from the market. But I think they did reach many women and the pads survived much longer than the turn of the century as the ads below attest. 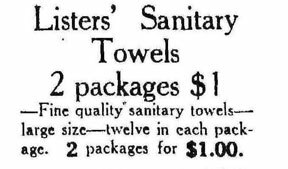 And at least one other disposable appeared in America before Kotex muscled in in the early 1920s: Curads, now mostly known for its bandages (that term has been also used for menstrual pads) - see an ad in Vogue magazine. I again thank the kind genealogy researcher who found this valuable evidence, below! Below: From the Oakland Tribune, September 30, 1904 (see the arrow). Lister's is the only menstrual pad listed! Below: November 21, 1921, Oakland [California] Tribune. Look how the regular price doubled from 1904 to 1921, same newspaper, above, but without inflation figured in. Hey, typo! The apostrophe should be between the r and s in the title! Below: June 8, 1922, Reno [Nevada] Evening Gazette. Look at the bandeau ad below the Lister's; they were fabric bands without cups that compressed the breasts. Sized cups appeared in the 1930s. Flat or minimal breasts were the rage then, as in John Held's College Girl painting, here. Typo again, or dirt? Below: Lima [Ohio] News, May 1, 1924. See Lister's Towels at the bottom of the right-hand column. Wait, what's THAT? Mum deodorant - no relation to your MUM, this museum - is under Toilet Articles. See an ad for the real thing!